BACK TO SCHOOL -GRAMMAR IN CONTEXT- I. Sts read the text and fill in the blanks with the right CONJUNCTION from the box.Key is included. II. 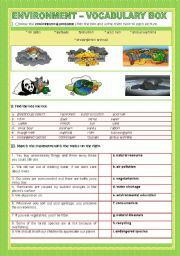 SPEAKING ACTIVITY –Sts state their views on a quotation. I´m thankful to Philip Martin for his nice clipart.Hope it may be useful!Hugs! 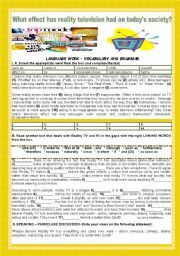 Language work -Vocabulary-I. A. Sts select the appropriate word from the box and complete the text.B.GRAMMAR IN CONTEXT-Sts read another text that also deals with Reality TV and fill in the gaps with the right LINKING WORDS from the box.KEY IS PROVIDED. II. SPEAKING – PAIR/CLASS DISCUSSION.Wish you a great week!Hugs! 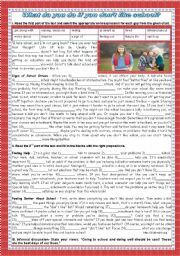 TOPIC:TEENS AND NEW TECHNOLOGIES READING/COMPREHENSION(TEXT+PERSONAL RESPONSE)+SPEAKING ACTIVITY Hope it may be useful to you!Have an excellent Friday!Thanks for your comments!Hugs! 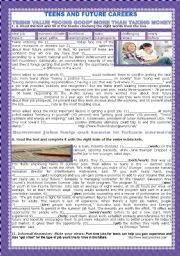 Grammar in context- Study skills- Prepositions. First, sts fill in gaps with the right Preposition. (Key is included). 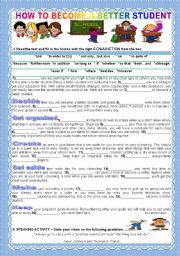 Then they have a Speaking activity- Your study skills/methods. Wish you a great Tuesday!Hugs! CONVERSATION - CLASS DEBATE:TO WHAT EXTENT DOES TECHNOLOGY AFFECT OUR DAILY LIFE? 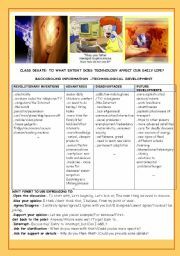 TOPIC: TECHNOLOGICAL WORLD/DEVELOPMENT Sts are given background information about REVOLUTIONARY INVENTIONS/ADVANTAGES/DISADVANTAGES OF TECHNOLOGICAL DEVELOPMENT/ FUTURE DEVELOPMENTS Have a great 2010! 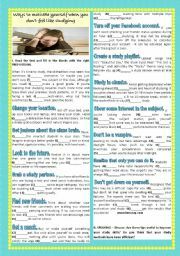 A 2-page ws-TOPIC-TEENS AND FUTURE CAREER. I-VOCABULARY-A- Sts select words from a box.B- Sts find equivalents.II-GRAMMAR-PREPOSITIONS.KEY IS PROVIDED. III-SPEAKING-PERSONAL RESPONSE+PAIR/CLASS DISCUSSION. Hope it may be useful!Have an unforgettable week!Hugs!